Associates In Eye Care of Florida proudly recognizes Dr. Joe Reyes as Medical Director of Bonita Springs and Dr. Christine Dee-Reyes as Medical Director of Fort Myers. We have been serving Southwest Florida for over 40 combined years. Our highly-trained professionals have been hand-picked from among the best in the industry. We are trained to provide you with the solutions you need as well as the quality you deserve. We have made a strong presence in our business market and are continuously striving to offer the best to our patients, something you will quickly realize when you choose us. 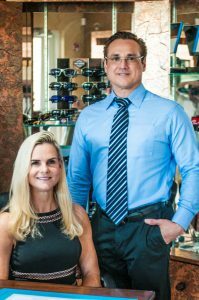 Associates In Eye Care Of Florida has achieved success through the use of clarity and the understanding of our patients’ needs. We know that you will find what you are looking for with our optometry services because we stand behind our work and know that we will deliver the satisfaction that you’re looking for. For your protection we are licensed, certified, insured, locally owned and we also offer warranties. Whether you need contact lens glasses exam or a full eye medical exams, we’re here to help. All you need to do is give us a call and we’ll take care of the rest. In the meantime, feel free to take a look around our site to learn more about our services. If you have any questions or concerns, please don’t hesitate to contact us at any time.